Cuong Ton-That obtained a BSc in Physics (Honours, University Medal) from UTS and a PhD degree in the field of surface science from the Robert Gordon University, UK in 2000. He joined UTS in 2003 as a lecturer. Prior to working at UTS, he was a postdoctoral research associate in the Nanoscience Centre, University of Cambridge from 2000-2003. 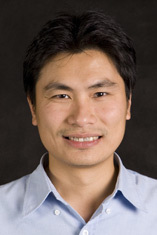 His research is focused upon the development of oxide materials and nanostructures for optoelectronic applications. He has expertise in the growth and characterisation of zinc oxide nanostructures together with experience in luminescence spectroscopy, synchrotron-based X-ray techniques, deep-level transient spectroscopy and scanning probe microscopy techniques. © 2018 Wiley-VCH Verlag GmbH & Co. KGaA, Weinheim Organolead mixed-halide perovskites capable of emitting multiple colors not only allow the fabrication of compact devices but also improves the functionality of light emitting devices beyond conventional displays. Here we demonstrate a cost-effective chemical dip-coating technique to grow highly reproducible methylammonium-lead-halide perovskite film, which exhibits highly efficient multi-color emissions of red, green and ultraviolet. The power- and temperature-resolved cathodoluminescence analyses reveal that these emissions are attributed to localized excitions with thermal activation energies of 27, 29 and 57 meV. The non-linear fitting of these emission band widths within the frame work of Boson model reveals that excitons are strongly coupled to the lattice with energy of 28 meV, which is consistent with the Raman measurement. This work presents an effective method for the deposition of high-quality and large-area perovskite film, which could be useful for high-performance multi-color display devices. Plasmonic nanostructures have been broadly investigated for enhancing many photophysical properties of luminescent nanomaterials. Precisely controlling the distance between the plasmonic nanostructure and the luminescent material is challenging particularly for the large-scale production of individual nanoparticles. Here we report an easy and reliable method for the large-scale dewetting of plasmonic gold nanoparticles onto core-shell (CS) upconversion nanoparticles (UCNPs). A commensurate NaYF4 shell with a thickness between 5 nm and 15 nm is used as a tunable spacer to control the distance between the UCNP and the plasmonic gold nanoparticles. The upconversion emission intensity of single gold decorated core-inert shell (Au-CS) UCNPs is quantitatively characterized using a scanning confocal microscope. The results demonstrate the highest feasible enhancement of upconversion emission and a record reduction in lifetime for UCNPs fabricated in this manner. The Au-CS UCNPs are further investigated by simulation and synchrotron near edge X-ray absorption fine structure (NEXAFS) analysis. © 2017 The effects of Ce- and La-doped WOxnanostructures on the morphology and crystal structures of WOxnanowires are investigated first, then the impact of these dopants on the cathodoluminescence (CL) properties of the WOxnanowires is studied. The dopants induced a morphological evolution and crystalline lattice expansion of the WOxnanostructures. By analyzing the surface composition and oxidation state ratios of W5+/W6+in each sample using X-ray photoelectron spectroscopy, we attempt to interpret the observed CL spectra shift from ultraviolet to blue emission of the Ce- and La-doped nanowires. Bottom-up fabrication of nanowire-based devices is highly attractive for oxide photonic devices because of high light extraction efficiency; however, unsatisfactory electrical injection into ZnO and poor carrier transport properties of nanowires severely limit their practical applications. Here, we demonstrate that ZnO nanorods doped with Ga donors by in situ dopant incorporation during vapour-solid growth exhibit superior optoelectronic properties that exceed those currently synthesised by chemical vapour deposition, and accordingly can be electrically integrated into Si-based photonic devices. Significantly, the doping method was found to improve the nanorod quality by decreasing the concentration of point defects. Light-emitting diodes (LEDs) fabricated from the Ga-doped ZnO nanorod/p-Si heterojunction display bright and colour-tunable electroluminescence (EL). These nanorod LEDs possess a dramatically enhanced performance and an order of magnitude higher EL compared with equivalent devices fabricated with undoped nanorods. These results point to an effective route for large-scale fabrication of conductive, single-crystalline ZnO nanorods for photonic and optoelectronic applications. Enhancing the efficiency of upconversion nanoparticles (UCNPs) and therefore their brightness is the critical goal for this emerging material to meet growing demands in many potential applications including sensing, imaging, solar energy conversion and photonics. The distribution of the photon sensitizer and activator ions that form a network of energy transfer systems within each single UCNP is vital for understanding and optimizing their optical properties. Here we employ synchrotron-based X-ray Photoelectron Spectroscopy (XPS) to characterize the depth distribution of Yb3+ sensitizer ions in host NaYF4 nanoparticles and systematically correlate the structure with the optical properties for a range of UCNPs with different sizes and doping concentrations. We find a radial gradient distribution of Yb3+ from the core to the surface of the NaYF4 nanoparticles, regardless of their size or the sensitizer's concentration. Energy dispersive X-ray Spectroscopy (EDX) was also used to further confirm the distribution of the sensitizer ions in the host matrix. These results have profound implications for the upconversion optical property variations. The removal of sulfamethazine (SMT), tetracycline (TC) and chloramphenicol (CP) from synthetic wastewater by raw (M3) and nitrogen plasma modified steel shavings (M3-plN2) was investigated using batch experiments. The adsorption kinetics could be expressed by both pseudo-first-order kinetic (PFO) and pseudo-second-order kinetic (PSO) models, where correlation coefficient r(2) values were high. The values of PFO rate constant k1p and PSO rate constant k2p decreased as SMT-M3>SMT-M3-plN2>TC-M3-plN2>TC-M3>CP-M3>CP-M3-plN2 and SMT-M3>SMT-M3-plN2>TC-M3>TC-M3-plN2>CP-M3>CP-M3-plN2, respectively. Solution pH, adsorbent dose and temperature exerted great influences on the adsorption process. The plasma modification with nitrogen gas cleaned and enhanced 1.7-fold the surface area and 1.4-fold the pore volume of steel shavings. Consequently, the removal capacity of SMT, TC, CP on the adsorbent rose from 2519.98 to 2702.55, 1720.20 to 2158.36, and 2772.81 to 2920.11g/g, respectively. Typical chemical states of iron (XPS in Fe2p3 region) in the adsorbents which are mainly responsible for removing antibiotics through hydrogen bonding, electrostatic and non- electrostatic interactions and redox reaction were as follows: Fe3O4/Fe(2+), Fe3O4/Fe(3+), FeO/Fe(2+) and Fe2O3/Fe(3+). © 2016 Elsevier B.V. Undoped and Li-doped ZnO films with bright visible luminescence have been fabricated by the spray pyrolysis technique at 400 °C. The pyrolytic films exhibit multi-coloured emissions of yellow, green and blue, which can be tuned by varying the Li concentration. Simulation of the cathodoluminescence spectra from the Li-doped films using the Huang-Rhys model reveals the energies of the luminescence centres and their electron-phonon coupling strength. These centres are attributable to either V Zn or Li Zn acceptor states. This work presents a practical route to fabricate inexpensive multi-coloured light emitting coatings on any substrate. © 2016 Elsevier Ltd.ZnO nanowires with various concentrations of nitrogen molecules have been fabricated by remote plasma annealing. X-ray absorption near-edge spectroscopy (XANES) reveals that nitrogen exists mainly in two chemical states: atomic nitrogen substituting oxygen (NO) and molecular nitrogen (N2) weakly bound to the ZnO lattice; the latter state increases substantially with prolonged plasma time. Cathodoluminescence microanalysis of individual nanowires reveals a broad emission band at 3.24eV at 10K, attributable to the recombination of a shallow donor and a N2 acceptor state. The Raman modes at 547 and 580cm-1 from the N-doped nanowires are found to rise in proportion to the N2 concentration, indicating they are related to N2 molecules or defects caused by the incorporation of N2 in the nanowires. © 2017 IOP Publishing Ltd. We present a correlative experimental and theoretical study of bound excitons in hydrogen-doped ZnO, with a particular focus on the dynamics of their metastable state confined in the sub-surface region, using a combination of surface-sensitive characterisation techniques and density functional theory calculations. A metastable sub-surface emission at 3.31 eV found in H-doped ZnO is attributed to the radiative recombination of indirect excitons localised at basal plane stacking faults (BSFs) where the excitonic transition involves electrons bound to bond-centre hydrogen donors in the potential well of the BSF. Additionally, our work shows the electrical transport of ZnO Schottky junctions is dominated by electrons confined at BSFs in the near-surface region. We investigate the optical signature of the interface in a single MgZnO/ZnO heterojunction, which exhibits two orders of magnitude lower resistivity and 10 times higher electron mobility compared with the MgZnO/Al2O3 film grown under the same conditions. These impressive transport properties are attributed to increased mobility of electrons at the MgZnO/ZnO heterojunction interface. Depth-resolved cathodoluminescence and photoluminescence studies reveal a 3.2eV H-band optical emission from the heterointerface, which exhibits excitonic properties and a localization energy of 19.6meV. The emission is attributed to band-bending due to the polarization discontinuity at the interface, which leads to formation of a triangular quantum well and localized excitons by electrostatic coupling. A correction to this article has been published and is linked from the HTML version of this paper. The error has been fixed in the paper. Wide-bandgap semiconductors (WBG) are expected to be applied to solid-state lighting and power devices, supporting a future energy-saving society. Here we present evidence of p-type conduction in the undoped WBG -Ga2O3. Hole conduction, established by Hall and Seebeck measurements, is consistent with findings from photoemission and cathodoluminescence spectroscopies. The ionization energy of the acceptor level was measured to be 1.1eV above the valence band edge. The gallium vacancy was identified as a possible acceptor candidate based on thermodynamic equilibrium Ga2O3 (crystal) – O2 (gas) system calculations (Kroger theory) which revealed a window without oxygen vacancy compensation. The possibility of fabricating large diameter wafers of -Ga2O3 of p and n type nature, provides new avenues for high power and deep UV-optoelectronic devices. The influence of deep level surface defects on electrical and gas sensing properties of ZnO nanorods NH3(g) sensors was studied. ZnO nanorods 5060 nm in diameter were synthesized via low-temperature hydrothermal growth at 90 degrees C on sapphire substrates. The as-grown nanorods exhibited a cathodoluminescence (CL) peak centered at 1.90 eV (YL), attributed to LiZn deep acceptors or O interstitials. Subsequent annealing in O2 at 1 atm and Zn vapor at 650 degrees C produced broad CL peaks centered at 1.70 eV (RL) and 2.44 eV (GL), respectively. The RL and GL have been ascribed to acceptor-like VZn and donor-like VO related centers, respectively. Electrical and gas sensing measurements established that the NH3 gas response sensitivity was 22.6 for O-2 anneal (RL), 1.4 for Zn vapor anneal (GL), and 4.1 for the as-grown (YL) samples. Additionally, treatment in H-plasma quenched the RL and inverted the NH3 electrical response due to the incorporation of H donors. Changes in the gas sensing response are explained by a shift in the position of the ZnO Fermi level relative to the chemical potential of NH3 gas due to the creation of near surface donor or acceptors. These data confirm that ZnO nanorods arrays can be tailored to detect specific gas species. Room temperature single photon emitters are very important resources for photonics and emerging quantum technologies. In this work, we study single photon emission from defect centers in 20nm zinc oxide (ZnO) nanoparticles. The emitters exhibit bright broadband fluorescence in the red spectral range centered at 640nm with polarized excitation and emission. The studied emitters showed continuous blinking; however, bleaching can be suppressed using a polymethyl methacrylate coating. Furthermore, hydrogen termination increased the density of single photon emitters. Our results will contribute to the identification of quantum systems in ZnO. (C) 2014 AIP Publishing LLC. revealed from comparison between the DRCLS intensities and SIMS data. Photoluminescent and structural properties of nanocomposite films consisting of green-emitting polyfluorene (PF) and Al-doped ZnO (AZO) nanoparticles were investigated. Topographical analysis shows that AZO nanoparticles can be homogeneously dispersed in PF films with less than 10 wt.% AZO. Photoluminescence of the composite films was investigated under wavelength selective excitation of AZO. Photoexcitation with laser energy below the AZO bandgap produces a slight increase in the PF emission intensity with increasing AZO concentration, accompanied by a spectral blueshift. These effects are attributed to separation of polymer chains and twisting of the PF backbone as revealed by Raman spectroscopy. On the other hand, photoexcitation above the AZO bandgap shows a remarkable enhancement, with the intensity at 510 wt.% AZO being three times greater than that of pure PF. The luminescence enhancement is attributed to the efficient transfer of energy from AZO nanoparticles to PF. The crystallographic and optical properties of Mn-doped ZnO nanoparticles prepared by a sol-gel process have been investigated by X-ray diffraction, UV-visible absorption spectroscopy and cathodoluminescence microanalysis. X-ray diffraction reveals that the nanoparticles have hexagonal wurtzite crystal structure, with the lattice constants along the a-and c-axes increasing with increasing Mn concentration from 0 to 2.4 at%. For all Mn concentrations in this range, the nanoparticles are essentially free of native point defects so that they exhibit only band-edge luminescence. The optical bandgap and band-edge emission energies for Mn-doped ZnO were found to increase in proportion to the lattice constants. The direct correlation between the bandgap and crystal structure suggests that the band-edge optical properties of Mn-doped ZnO is predominantly influenced by the amount of Mn atoms substituting Zn on the lattice sites. Cathodoluminescence spectra have been measured to determine the characteristics of ubiquitous green luminescence (GL) in nonstoichiometric zinc oxide (ZnO). Zn- and O-rich ZnO were found to exhibit characteristic emissions at 2.53 eV [full width at half-maximum (FWHM) 340 meV] and 2.30 eV (FWHM 450 meV), respectively. Hydrogen was used to probe the physical nature of GL centers. The Zn-rich GL is enhanced upon H incorporation, whereas the O-rich GL is completely quenched as its underlying acceptor-like V-Zn centers are passivated by H. The GL emission bands each exhibit remarkably different excitation-power dependencies. The Zn-rich GL follows a close to linear relationship with excitation power, while the O-rich GL exhibits a square-root dependence. Calculations based on bimolecular recombination equations show the defect concentration in Zn-rich ZnO is three orders of magnitude greater than that in O-rich ZnO, indicating V-O is more readily formed than V-Zn in thermochemical treatments of ZnO. Polyfluorene (PF) and its derivatives are very promising candidates for organic light emitting diodes (OLEDs) in lighting applications because of their high photoluminescence and electroluminescence efficiencies. Recent investigations of potential materials for OLEDs have shown that introducing n-type inorganic nanoparticles into conjugated polymers is efficient to produce stable and high performance devices. In this study, composite thin films made by incorporation of zinc oxide (ZnO) nanoparticles into a PF derivative have been prepared and their optical properties have been investigated. The prepared thin films were stored in different media (in air, in vacuum, in the dark or exposed to light) in order to study environmental influences on the material stability. Analysis of spectral data obtained from infrared (IR), Raman, UV-vis, and photoluminescence (PL) measurements shows a large enhancement in luminescence for polymer nanocomposites while using high nanoparticle concentrations (within a limit of 10% ZnO). Time-resolved PL performed on those nanocomposite films corroborated the above result: it indicated that the light-emission enhancement can be explained by efficient energy transfer from nanoparticles to the polymer chains and increase of the chain separation distance. In addition, the nanocomposites were found to be more stable than pristine polymer films whatever the storage conditions were used. It was confirmed by IR analysis that incorporation of nanoparticles into polymers prohibited the formation of fluorenonyl groups in PF chains, which was identified as the main cause of the degradation of the polymer under photo-oxidation. ZnO crystals have been investigated by scanning cathodoluminescence microscopy and spectroscopy at 80 K following hydrogen incorporation by plasma exposure. The intensity of the ZnO near-band-edge ( NBE) emission is greatly enhanced while the defect-related green emission is quenched following plasma treatment. These effects are attributed to the passivation of zinc vacancies by hydrogen. The green and yellow intensities and their intensity ratios to the NBE vary with excitation depth for both undoped and H-doped ZnO crystals. The intensities of the green and yellow emissions exhibit sublinear dependencies on electron beam excitation density while the NBE intensity increases linearly with the excitation density. These saturation effects with increasing excitation density must be taken into account when assessing defects in ZnO by luminescence characterization. ZnO structures were synthesised on the sapphire (112 0) substrate by a vapour transport method in a gas !owing furnace. The in!uence of the oxygen content in the gas mixture on the morphology and luminescent properties of ZnO structures grown on a strip-like substrate was investigated, with all other growth parameters being kept nominally identical. Integrated electron microscopy and cathodoluminescence analysis shows gradual variations of structural and optical emission properties for ZnO structures grown on the long substrate. Defect-related green luminescence of ZnO is found to be highly dependent on the oxygen vapour in the growth region of the furnace. Our "ndings demonstrate that the green luminescence is associated with oxygen de"ciency in ZnO. Fe-doped ZnO was successfully fabricated by thermal in-diffusion of Fe into ZnO crystals. X-ray absorption near edge structure (XANES), photoemission and cathodoluminescence (CL) spectroscopy have been combined to examine the Fe diffusion and its effects on the electronic and optical properties of the crystal. Depth-resolved CL demonstrates that Fe in-diffusion occurs to at least 4 µm depth and results in intense green luminescence, whereas the undoped crystal exhibits only the ZnO near-band-edge emission. XANES and valence-band photoemission show that Fe is incorporated as Fe2+/3+ ions on substitutional Zn sites. The results suggest that the variation in the CL properties is due to a change in the oxygen vacancy charge state as a result of electron transfer from Fe. The surface electronic structure of ZnO nanoparticles has been studied with photoemission and x-ray absorption spectroscopies. Contrary to expectation, ZnO:Zn phosphor nanoparticles were found to contain a lower oxygen vacancy density on the surface than undoped ZnO counterparts, but oxygen vacancies are in different chemical environments. Cathodoluminescence shows intense green luminescence from the ZnO:Zn surface, while the undoped nanoparticles exhibit only the near-band-edge emission. The results indicate the roles of surface oxygen vacancies and their environment in the previously unexplained green luminescence from the ZnO:Zn material. Luminescence properties of vertically aligned, crystalline ZnO nanorods are studied by cathodoluminescence (CL) spectroscopy and microscopy. Results show that luminescence characteristics vary dramatically with location on the nanorod as well as CL excitation depth. CL inhomogeneity is observed between the nanorod tip and sidewalls, accompanied by a variation in the chemical environment of surface oxygen ions as probed by photoemission spectroscopy. Our findings demonstrate that CL can provide useful information on the local optical properties of nanostructured materials, which is simply beyond the capability of other methods. Vertically aligned ZnO nanowires were synthesized on a sapphire (11 (2) over bar0) substrate by vapour deposition and their light-emitting properties were characterized using photoluminescence and cathodoluminescence spectroscopies. Besides the nanowires, there exists a mosaic ZnO film on the substrate surface. Comparison of the luminescent properties of the as-grown ensemble and the nanowires extracted from it shows that the mosaic film is the major source of the defect-related green emission while the nanowires possess highly crystalline quality with virtually no defects. Photoemission spectroscopy shows that the valence band states associated with O 2p from the as-grown sample are diminished compared with those from the extracted nanowires. These findings suggest that the green emission partly arises from oxygen vacancies located on the surface of the mosaic film. Luminescence properties of nanocomposites consisting of ZnO nanoparticles in a conjugated polymer, poly [2-methoxy-5-(2?-ethyl hexyloxy)-phenylene vinylene] (MEH-PPV), were investigated. Photoluminescence measurements reveal a blue shift in the emission spectrum of MEH-PPV upon incorporation of ZnO nanoparticles into the polymer film while the emission is increasingly quenched with increasing ZnO concentration. In contrast, the structure of the polymer and its conjugation length are not affected by the presence of ZnO nanoparticles (up to 16 wt% ZnO) as revealed by Raman spectroscopy. The blue shift and photoluminescence quenching are explained by the separation of photogenerated electronhole pairs at the MEH-PPV/ZnO interface and the charging of the nanoparticles. Vertically aligned ZnO nanowires were synthesized on a sapphire ([Formula: see text]) substrate by vapour deposition and their light-emitting properties were characterized using photoluminescence and cathodoluminescence spectroscopies. Besides the nanowires, there exists a mosaic ZnO film on the substrate surface. Comparison of the luminescent properties of the as-grown ensemble and the nanowires extracted from it shows that the mosaic film is the major source of the defect-related green emission while the nanowires possess highly crystalline quality with virtually no defects. Photoemission spectroscopy shows that the valence band states associated with O 2p from the as-grown sample are diminished compared with those from the extracted nanowires. These findings suggest that the green emission partly arises from oxygen vacancies located on the surface of the mosaic film. The electronic structure of potassium-doped La@C82 has been studied with synchrotron-radiation photoelectron spectroscopy. Ultraviolet photoemission measurements indicate evolution of the valence-band states of La@C82 with increasing potassium content, but KxLa@C82 remains semiconducting for all x between 0 and 6, with a band gap of at least 0.4 eV, in contrast to K-doped C60. The valence-band features, including those which arise from the interactions of C82 cages with La and K, show oscillatory behavior of photoemission intensity with incident photon energy. The strength of the oscillations varies between the states, and we associate diminished oscillations with increased localization of electron density. Finally, although core and valence states of La@C82 change considerably with potassium dosage, the encapsulated La atom is well shielded from the outside chemical environment and its valency remains close to 3+. The photon-energy dependences of valence-band photoemission spectra have been investigated for monolayer, submonolayer, and multilayer C60 films on Ag(111). The intensity ratios of the highest and next-highest occupied molecular orbitals (the HOMO and NHOMO) of the films are found to oscillate with the same period as the incident photon energy is varied, but the amplitude of the oscillation is smaller with lower film coverage. Since the characteristics of the molecular orbitals of C60 in the monolayers are considerably different from those of the thick film due to the charge-transfer interaction between the metallic surface and the molecule the observation opposes the proposal in which the oscillation is entirely dependent on the nature of the empty and occupied states involved in the photoemission process. The results instead support the photoelectron interference model by Hasegawa et al. [Phys. Rev. B 58, 4927 (1998)]. Variation of the oscillation amplitude with C60 coverage is explained in terms of hybridization of the HOMO and NHOMO with the surface. Depositing C60 onto Ag(111) held at a high temperature produces a single-phase (2sqrt×2sqrt) R30° C60 monolayer. Angle-resolved photoemission experiments reveal changes in the relative intensities of the two bands with the azimuth-emission angle, measured with respect to the symmetry axes of the ordered monolayer. The intensity modulation is due to anisotropic scattering of photoelectrons along various molecular axes. The orientation of the endohedral La atom in La@C82 adsorbed on Cu(111) has been determined using the normal-incidence x-ray standing wave (NIXSW) technique. The NIXSW measurements were carried out using both the normal ?111? and 70.5° off-normal ?1¯11? Bragg reflections. The La ?1¯11? profiles of the La@C82 monolayer and submonolayers are found to be similar to the ?111? profile of the multilayer, while the ?111? profiles of the monolayer and submonolayers are distinctly different with much lower peak height. This indicates significant ordering of the La atoms in the monolayers with respect to height above the Cu surface but little lateral ordering. The results of curve fits to the monolayer profiles show that the La atoms are regionally located at 1.62 (±0.77) Å above an extended scattering plane from the crystal. Cooling the monolayers to a temperature of 170 K increases ordering of the La atoms with respect to height above the surface. The NIXSW results demonstrate that the endohedral molecules adopt a restricted orientation upon adsorbing on the surface and the La atom resides on either the upper or lower half of the cage. Theoretical calculations show that the most stable La positions are located in the top half of the fullerene cage, which supports the La upper configuration. The results are explained in terms of electrostatic interactions between the endohedral atom, the fullerene cage, and the substrate. Ton-That, C, Shard, AG, Egger, S, Dhanak, VR & Welland, ME 2003, 'Modulations of valence-band photoemission spectrum from C60 monolayers on Ag(111)', Physical Review B - Condensed Matter and Materials Physics, vol. 67, no. 15, pp. 1554151-1554156. The photon-energy dependences of valence-band photoemission spectra have been investigated for monolayer, submonolayer, and multilayer C60 films on Ag(111). The intensity ratios of the highest and next-highest occupied molecular orbitals (the HOMO and NHOMO) of the films are found to oscillate with the same period as the incident photon energy is varied, but the amplitude of the oscillation is smaller with lower film coverage. Since the characteristics of the molecular orbitals of C60 in the monolayers are considerably different from those of the thick film due to the charge-transfer interaction between the metallic surface and the molecule the observation opposes the proposal in which the oscillation is entirely dependent on the nature of the empty and occupied states involved in the photoemission process. The results instead support the photoelectron interference model by Hasegawa et al. [Phys. Rev. B 58, 4927 (1998)]. Variation of the oscillation amplitude with C60 coverage is explained in terms of hybridization of the HOMO and NHOMO with the surface, Depositing C60 onto Ag(111) held at a high temperature produces a single-phase (23 × 23) R30° C60 monolayer. Angle-resolved photoemission experiments reveal changes in the relative intensities of the two bands with the azimuth-emission angle, measured with respect to the symmetry axes of the ordered monolayer. The intensity modulation is due to anisotropic scattering of photoelectrons along various molecular axes. The orientation of the endohedral La atom in La@C82 adsorbed on Cu(111) has been determined using the normal-incidence x-ray standing wave (NIXSW) technique. The NIXSW measurements were carried out using both the normal 111 and 70.5° off-normal 1¯11 Bragg reflections. The La 1¯11 profiles of the La @C82 monolayer and submonolayers are found to be similar to the 111 profile of the multilayer, while the 111 profiles of the monolayer and submonolayers are distinctly different with much lower peak height. This indicates significant ordering of the La atoms in the monolayers with respect to height above the Cu surface but little lateral ordering. The results of curve fits to the monolayer profiles show that the La atoms are regionally located at 1.62 (±0.77) Å above an extended scattering plane from the crystal. Cooling the monolayers to a temperature of 170 K increases ordering of the La atoms with respect to height above the surface. The NIXSW results demonstrate that the endohedral molecules adopt a restricted orientation upon adsorbing on the surface and the La atom resides on either the upper or lower half of the cage. Theoretical calculations show that the most stable La positions are located in the top half of the fullerene cage, which supports the La upper configuration. The results are explained in terms of electrostatic interactions between the endohedral atom, the fullerene cage, and the substrate. © 2003 The American Physical Society. Thin films of polystyrene (PS)/polymethylmethacrylate (PMMA) blends have been spin cast on mica from chloroform solutions. When the concentration of PMMA in the casting solution is less than that of PS a pitted morphology is formed. The average sizes of the pits are shown to increase with both the total concentration of the casting solution and the relative concentration of PMMA. The change in pit size is explained in terms of incomplete dewetting of a PMMA solution from an underlying PS solution. For a given ratio of PMMA/PS the average pit diameters appear to increase linearly with the square of the film thickness, the gradient of which is dependent on the film composition. Films of polystyrene (PS) and poly(methyl methacrylate) (PMMA) blends of two different thicknesses have been examined by X-ray photoelectron spectroscopy (XPS) and atomic force microscopy (AFM). Blends with different compositions were spin-cast onto a mica substrate with chloroform as the mutual solvent. XPS measurements revealed surface enrichment of PMMA in all compositions. The thicker (66 nm) films exhibit a higher degree of PMMA surface enrichment than the thinner (17 nm) films. AFM imaging allows distinctions to be drawn between blends with differing compositions. The blend films with less than 50% PMMA bulk concentration generally exhibit pitted surfaces; the pit size varies with film thickness and bulk composition. When the PMMA bulk concentration is greater than 50%, the film surface changes to show island-like phase-separated structure. The surface segregation and morphology are explained in terms of solubilities of the two polymers in the solvent and dewetting of PMMA relative to PS. The phase domains on the film surface have also been resolved by frictional force microscopy (FFM) using hydrophilic tips bearing hydroxyl groups. Films of polystyrene (PS) and poly(methyl methacrylate) (PMMA) blend have been annealed at a temperature above their glass transition temperatures for up to 48 h. Surface chemical compositions of the cast and annealed films were measured by X-ray photoelectron spectroscopy (XPS) while surface topographical changes were followed by atomic force microscopy (AFM). The blend films spin-cast from chloroform produce nonequilibrium surfaces with a significant excess of PMMA. The polymer component with a lower surface free energy, PS, is shown to segregate to the surface upon annealing. The PS surface concentration of the films, containing 50% PS:50% PMMA in the bulk, was evaluated using the ester peak in XPS C Is spectra (sampling depth similar to9 nm) and found to increase from similar to5% (freshly spin-cast film) to a saturated level of similar to 47% after 17 h of annealing. AFM imaging reveals evolution of blend morphology with annealing time. The spin-cast films prior to annealing exhibit pitted topography with typical pit size of similar to1.2 mum and depth of 30-40 nm. As the annealing process proceeds, these pits get continually shallower. Frictional force microscopy with hydroxylated tips recorded surface phase separations for the films of 2-4 h annealing. As the annealing continues to above 14 h, the pitted structure becomes distorted. The surface enrichment and morphology changes upon annealing are explained by dewetting of PMMA relative to PS. The surfaces of standard untreated polystyrene cell culture dishes have been oxidatively modified for up to 8 min exposure time using an ultraviolet ozone treater in order to promote cell adhesion. Surface oxygen chemisorption and topographical modification has been characterized using monochromatic X-ray photoelectron spectroscopy (XPS) and atomic force microscopy (AFM), respectively. The oxidation process is shown to proceed at low exposure times (<60 s) via the formation of C-OR groups, although some R2C=O and RO-C=O groups are also formed. At longer treatments, RO-C=O groups become the dominant species, although the other groups are also present. The maximum level of oxygen reached is 36 atomic 8. Some of the oxygen present at surfaces treated at times of >60 s is in the form of loosely bound low molecular weight oxidized material (LMWOM) which is produced by oxidative scission of the PS backbone. Water washing leads to a reduction in surface oxygen content mainly by the removal of RO-C=O and R2C=O functional groups. The residual stable oxygen levels, which can be introduced, are approximately 20-25 atomic %. Surface chemistry changes are accompanied by the formation of surface spikes which are about 30 nm high and 300-400 nm wide. A correlation between treatment time/oxygen level and overall roughness is observed. The effect of washing upon the topography is to slightly increase the surface roughness, although not to a significant degree. The attachment kinetics of adhesion for Chinese hamster ovary cells show that adhesion occurs much more rapidly for oxidized surfaces than for untreated control materials. A direct correlation between the levels of oxidation and the rate of cell adhesion is demonstrated. Polystyrene (PS) and poly(methyl methacrylate) (PMMA) thin films (<100 nm thickness) have been spin-cast from chloroform solution onto cleaved mica surfaces (roughness within 0.2 nm). An algorithm for calculating the film thicknesses based on the relative intensities of the C 1s peak of the films and the Si 2s peak of the mica from angle-resolved X-ray photoelectron spectroscopy (XPS) is presented. The film thickness changes as a function of casting conditions. Data from this approach are comparable with thickness measured by an atomic force microscopy (AFM) tip-scratch method in the range 1.5-5.5 nm. Thicknesses of the films are shown to increase linearly with concentration of cast solutions. Ton-That, C, Teare, DO, Campbell, PA & Bradley, RH 1999, 'Surface characterisation of ultrviolet-ozone treated PET using atomic force microscopy and x-ray photoelectron spectroscopy', Surface Science, vol. 435, pp. 278-282. Kirkup, L & Ton-That, C 1998, 'A direct reading thermometer based on a silicon diode', Physics Education, vol. 33, pp. 302-305. ZnO structures grown under controlled vapourphase transport growth conditions were characterised by electron microscopy and high-resolution cathodoluminescence techniques. Variations in the defect related emission and morphology were observed to be dependent on the distance from the source material. Annealing of grown structures under oxygen eliminated the defect emission. These experimental observations suggest that oxygen deficiency in ZnO is linked to the defect related emission, and that defect emission is strongly influence. Dowd, AR, Armstrong, NG, Ton-That, C, Johansson, B & Phillips, M 2008, 'Cathodoluminescence for High Resolution Non-Destructive Luminescence Depth Profiling. ', IUMRS-ICEM 2008 | COMMAD 2008, A-MRS, Sydney, Australia. The conductivity of polycrystalline fullerene films as a function of oxygen concentration was investigated and found to be affected significantly by changes in oxygen partial pressure. The conductivity of the film was fitted to an Arrhenius curve. Analysis of the data indicated that a change of 0.11eV in activation energy occurred as the oxygen pressure was varied over two orders of magnitude.